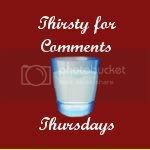 Acting Balanced: Thirsty for Comments? Link up here to share great commenting! Thirsty for Comments? Link up here to share great commenting!